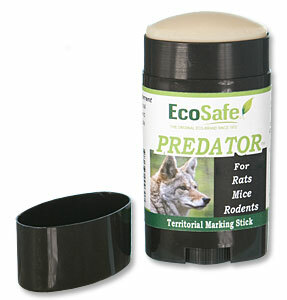 The scent from the Predator Stick is basically that of a coyote. So marking anything around the dogs with the scent of a coyote could have unpredictable results. As far as safety goes, the dogs could try to lick or remark the scent once they overcome their initial fear, this will not hurt the dogs, but could render the coyote scent useless. This product works best when it is used in areas where there are on other animals. I don't think it would work well around areas with existing dogs. We have several customers that use the T Rex Rat Trap inside of a Protecta Rodent Bait Station for rodent control areas dogs. It works great, traps the rats, and the dogs can't get to it.